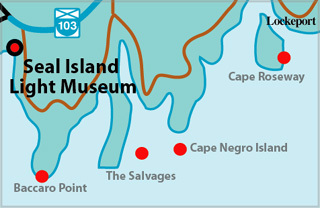 For visitors' inforrmation, go to Seal Island Light Museum on Facebook. 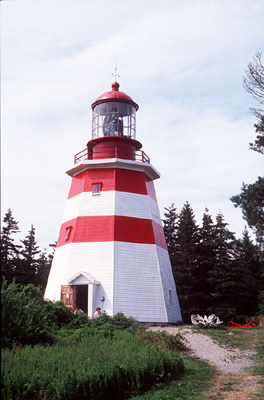 The museum, a replica of the top half of the Seal Island Lighthouse, displays lighthouse equipment and memorabilia of the Barrington and Cape Sable area, and tells the fascinating history of the lights on Cape Sable Island, Bon Portage, and Seal Island. The building is topped by the cast iron lantern which was removed from the tower in 1978. It was to be sent to Ottawa, but the community fiercely objected and the lantern was brought by helicopter to Barrington. Money was raised to build this museum to house the iron lantern and the Second Order Fresnel Lens. From the third level, you can climb the iron stairs as the keepers did for 76 years to see the original clockwork mechanism and the only installed Fresnel lens in Nova Scotia. Though the museum is closed in winter, the lens is lit for Christmas week.